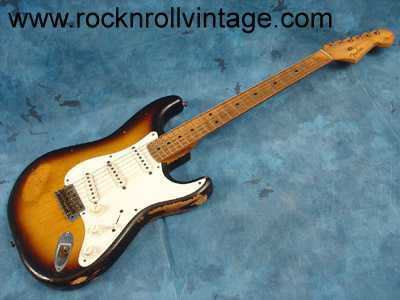 Fender Stratocaster- A brief history and popular models Fender is an icon of the musical instrument industry and Fender Stratocasters or "strats" are highly collectable. The Stratocaster was first introduced in spring 1954 and it's design is often copied. The ash body design was based on the precision bass and features an asymmetrical double cut body which is contoured on the back. The pick guard followed the contours of the guitar creating a new look for Fender. There are three single coil pickups and the jack is recessed and angled into guitar top. It featured the first combined bridge-vibrato unit providing the strat tremolo. There are 3 control knobs, Volume, Tone and Tone. In 1959 a rosewood fingerboard was added. 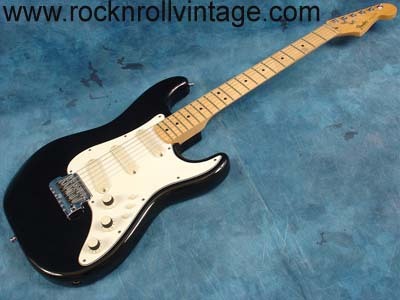 Fender was purchased by CBS in 1965 (pre-CBS strats are more desirable) and 1966 brought several changes including a larger headstock and a large "F" logo on the neck/body joining plate. In 1977 a 5 way selector was added to provide combinations of front and middle pickup and front and back pickup. Early finishes tended to be sunburst however the 70's tended towards natural finishes. Early 60's strats in Daphne Blue, Fiesta Red, Surf Green, Lake Placid blue and Burgundy Mist are unusual and desirable. In 1985 CBS sold fender back to Fender employees. The stratocaster is still in production with over 1 million guitars produced since introduction and remains the mainstay of the Fender product line. The Stratocaster is an icon of Rock N Roll. 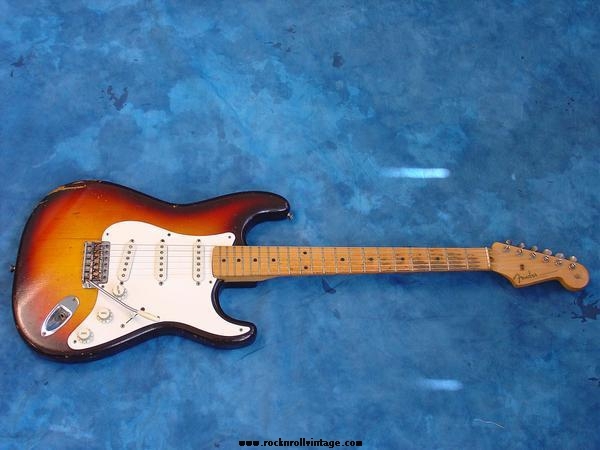 The "Strat" design featured a double cut design, contoured pick guard, recessed jack and great looks ! There were a few minor changes made in 55 from the first year 1954 model strat including headstock edges being less rounded and the tremolo cover was changed to oblong holes. 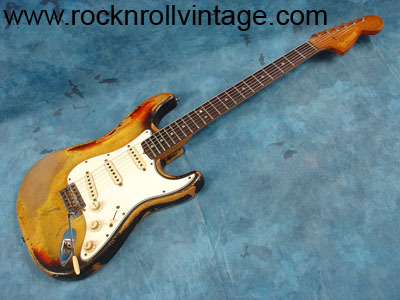 The 1958 Fender Stratocaster demonstrated additional changes as this great guitar continued to evolve. 58 models featured a 3 color sunburst changing from the original 2-tone sunburst. The neck shape was also changed from the previous models to a thinner shape. 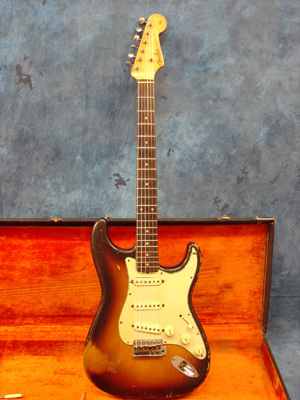 A nice 1960 strat. Notice the change to the fingerboard with the move to Rosewood. Some would call this whooped but we call it Beautiful! 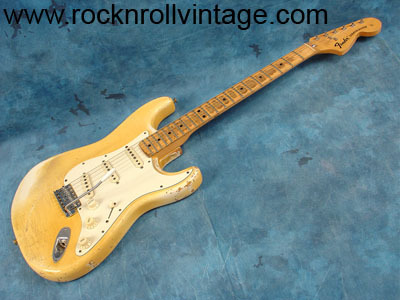 Here's a nice vintage 1966 stratocaster of the post CBS era. Some strats seem to look better with age and this one is worn in all the right places. This Strat also has attractive great wear.